Water Stains – Water stains are probably the most common indicators of a leak, and rainwater doesn’t necessarily have to drip from the ceiling. In addition to the ceiling, check the attic floor, rafters and roof deck for water stains. The more water stains you find, the more severe the leaks are. Pinholes of Light In the Attic – Inspect your attic on a sunny day. If you notice pinholes of light illuminating the attic floor, it means your roof already has been punched through from outer roofing material to roof deck. If this is the case, you will need to have your roof replaced as soon as possible. Clumped Insulation – When insulation comes into contact with water, it tends to form clumps, which can be easily spotted during a cursory inspection. If you find water-damaged insulation, take note of the area. It should clue you in and help you find the source of the leak. However, water-damaged insulation is useless and will have to be reapplied once the roofing leak is addressed. Deteriorated Sealant – It also helps to inspect your roof from the outside, which you can do using only a pair of binoculars. In addition to looking out for apparent signs of damage to the outer roofing layer, keep an eye out for areas that require sealant, especially if you have a metal roof. These areas include roof fasteners, seams and penetrations. Deteriorated sealant needs to be removed, the area cleaned, followed by a fresh application of sealant. Missing, Dislodged or Damaged Flashing – Flashing protects breaks and seams on the roofing plane. It can be the strips of metal installed on valleys, or where the roof meets a wall or dormer. Another type of flashing, called drip edge, is installed along the roof edge. Rubber boots are cone-shaped pieces of rubber that protect the base of penetrations such as vent pipes. Missing, dislodged or damaged flashing increases the likelihood of having hidden leaks on your roof. 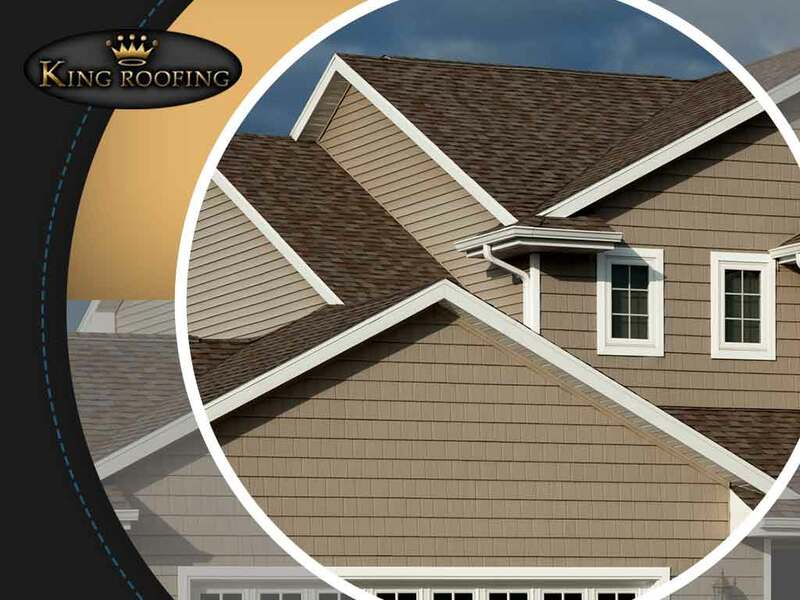 To learn more about our residential and commercial roofing services, call King Roofing today at (903) 218-8777. You can also fill out our contact form to schedule a free, no-obligation quote. We serve many areas in and near Athens, Canton and Gun Barrel City, TX.